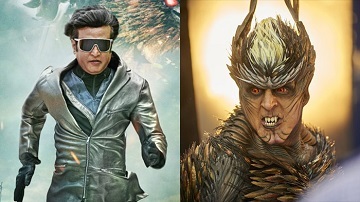 2.0 Hindi 5th Day Monday Box Office Collections - Rajnikanth and Akshay Kumar's 2.0 continued hold very strongly at the box office as the collections on Monday are super strong. The film continues to keep good pace as the film enters into weekdays after a super strong weekend. The collections on the 5th Day Monday are around 14 crore according to early estimates. 2.0 Hindi Lifetime collections after 5 days is around 110 crore plus and in terms of occupancy the film has matched the first day but the collections are lower as the ticket prices for the weekdays is reduced by 25-30%. Akshay Kumar's Highest grosser will be crossed in the extended week of 2.0.